Putting on the Devil’s Club dry-suit is like stepping into a trusted pair of Carhartt work pants. Its thick textured fabric is constantly re-assuring, reminding you of its durability and dependability. With this dry-suit on, you almost feel ready for a day of carpentry, rather than a day of boating. The Devil’s Club embodies many of the same qualities as its namesake, a prickly shrub prevalent in the Pacific Northwest. The plant was commonly used by First Nations and Native American tribes to ward off evil spirits. 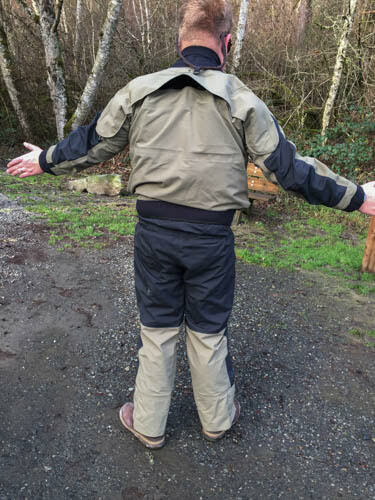 During my first trip in this dry-suit, I took a swim on a narrow, tree and sticker-bush lined river in Washington State. As I climbed the river bank, I could feel the suit shrug off thorns and small branches which would have damaged thinner dry-suits. Immersion Research has succeeded in their goal of creating a burly abrasion resistant dry-suit, ready for abuse. I have found that this dry-suit is ideal for trips on very cold days or rivers with brushy put-ins and takeouts. I felt comfortable carrying my raft down single-track foot paths lined by trees and brush. I also felt comfortable climbing across logs or obstacles in the river which may have penetrated other dry-suits. Because of its weight and relative lack of breathability, I will reserve the Devil’s Club for cold-weather trips. As a rear-entry suit, the Devil’s Club requires a second paddler to zip and check the back zipper, so make sure to bring a friend. The Devil’s Club is constructed of heavy three-layer nylon taslan fabric, which makes it heavier and more inflexible than comparative Kotakat or NRS dry-suits. When wearing the Devil’s Club, I often felt like I was wearing canvas work pants and a jacket. This can make the suit feel somewhat awkward or clunky when swimming, but this awkwardness is outweighed by its comfort while in your boat. While rowing, I never felt my movement being constricted and the thick fabric provides thermal protection from cold water. During a recent three-hour trip in 40-degree weather, I wore a union suit, fleece top, and wool socks underneath. The dry-suit did a great job maintaining body heat and keeping me warm. Because Devil’s Club’s fabric socks are also made of thick fabric, I discovered that my normal neoprene booties no longer fit. Therefore, I paddled in the leather work boots on-hand. For this suit, I recommend upsizing your neoprene booties by 1.5 sizes. Absolutely bombproof. As discussed above, the Devil’s Club is a tough abrasion-resistant option for environments rich with penetration risks. To that end, the suit is equipped with a protective fabric flap covering the relief zipper. As for the gaskets, they are thick and high-quality. I had to trim the neck gasket to avoid being asphyxiated, but this process was very quick and easy. Once properly trimmed, the suit is extremely comfortable. But What About The Color? When I received the Devil’s Club, I was concerned about the its organic-green color. Initially, I thought the color would make identification and rescue difficult. After trying on the Devil’s Club with my bright-red Astral Greenvest and white helmet, those concerns were dashed. The suit’s green color stands out in the water and among your fellow paddlers; it’s an aesthetically-pleasing alternative to the brightly-colored Kotakat and NRS dry-suits. Possibly recognizing concerns over dark and earth-tone colors, Immersion Research is introducing a new bright color: Cherry Bomb. Right now, the MSRP for the Devil’s Club is between $999-1,099. This puts it in the same price-range as competitors’ Gore-Tex models. For boaters who regularly find themselves in bony, log-jammed, or brush-lined rivers, I think price is reasonable. Wearing the Devil’s Club provides confidence that you can swim, walk, or climb across almost any terrain without fear of a tear or puncture. If you regularly raft on broad rivers with boat ramps and sandy beaches, you may want to alternatively consider IR’s Seven-Figure Dry-Suit. I’m confident that for years to come, the Devil’s Club will remain my first choice for both cold-weather and technical trips. Mark Trivett is a whitewater hobbyist from Washington State, and spends his weekends boating with his wife Shannon and their local whitewater club. When he's not on the water, Mark is a practicing attorney outside Seattle.